“David!” I yelled, gesturing at City Planning’s David Somers to come over and listen to what the residents playing cards in their yard were saying about the need for a stoplight at the intersection outside their front gate. Too many people had come crashing through it, they told me. And if it wasn’t their gate, they pointed across the street, it was the damaged stone wall kitty-corner from their yard. Just so I could fully grasp how bad the intersection at 82nd and Hooper was, the woman pulled out her camera and showed me a photo of a large red SUV parked practically on top of the hot water heater outside her bedroom window. She had been sleeping on the other side of that wall, she said. The driver had apparently tried to run away and hide, at first. Then, he came back and tried to drive the truck off (or something of that nature) before the Sheriffs finally stepped up and told him that wasn’t how things worked when you crashed into a house. Hooper’s just too fast of a street, they all reiterated. Wide open and curvy, people apparently feel like they can slalom along it, especially after they’ve had a few drinks. Which never ends well for anybody. And by “anybody,” I mean the residents in the area. David listened, expressed dismay, and finally moved off to join the rest of the group participating in the Complete Streets Ride as they rolled out. He was interested in their concerns, but there wasn’t much he could do. Florence-Firestone is unincorporated, so it’s not within the city’s jurisdiction. I stayed behind to chat for a few more minutes. The great benefit of participating in slow-moving community group rides, I find, is that we attract a lot of attention from curious residents. Both the rides and the door-knocking outreach I sometimes try to do beforehand allow me to engage a wide cross-section of people on how they feel about their neighborhoods, including any major concerns they may have and ideas for how they could be rectified. The residents at this location really only had two major complaints, one man said: the need for a stoplight at the intersection and the need to be protected from those that are supposed to protect and serve. He was tired of being followed by the cops for several blocks around the neighborhood where he had lived for years. Or being stopped and questioned for no reason. He was active in his community, he said. He worked with a foundation to distribute food and support activities for youth. Everyone called him “Coach.” And yet, even a well-respected, middle-aged community advocate like himself was regularly treated like a common criminal just because he was black. He wasn’t the first man to say this to me. In fact, I can think of few conversations I have had with men in the street about improving neighborhoods in South L.A. where the question of harassment by law enforcement has not come up. Access to the streets, for many of them, comes at the cost of regularly being followed, stopped, and questioned about who they are, where they are going, what their business is, and whether they have stolen property, weapons, or illegal substances on their person. It’s frustrating and humiliating, they say. That doesn’t mean that these men don’t care about other things. A young gang-banger who lived along Compton Ave., for example, pointed to the heavily cracked asphalt and potholes just outside his front gate and the poor condition of the garbage-strewn strips of dead and treeless grass alongside the curb as places the powers-that-be could start to make his neighborhood feel better about itself. But equal access to streets so that youth like him can engage in positive activities, like riding to Critical Mass (as he said he sometimes enjoyed doing), or so others will not have to suffer being regularly humiliated in front of their children, neighbors, or the local businesses they patronize is always near the top of the list with many men of color that I speak with. It comes up so often, in fact, that I can’t help but think that some of the readers of our South L.A. articles must feel I’m a bit of a broken record and not focused enough on more concrete planning issues. To me, however, the prevalence of the concern is a signal that the neither the city nor law enforcement has made a genuine commitment to dealing with biased policing among the rank-and-file, despite all lip-service to the contrary. This matters because, until these residents are treated with equal respect and dignity in the streets, the city will always struggle to engage them on most other issues that would benefit from community input. Think about it this way: How willing would you be to dedicate your time to investing in your community if you were treated as the human incarnation of neighborhood blight every time you stepped outside your door? How often would you participate in beautification projects, attend community events, lend your voice to community meetings, or involve your child in recreational programs if you knew that, every time you biked or walked back and forth to an event with your young daughter, you were likely to get stopped and questioned by police in front of her? Despite these obstacles, I know many men that continue to work towards making their neighborhoods better places. For many others, however, it can be discouraging and contribute to their disenfranchisement. Which means that, when I and others come through doing outreach for this or that community meeting to talk about community plans, mobility, or street-scaping, people sometimes have a hard time connecting to what we are talking about. Few things, I find, shut a conversation down faster and more effectively than launching into a spiel about bike lanes. Leading with infrastructure makes some assume that I am going to tell them what is good for them and that I will not be open to hearing about their own perceptions of their needs. Even when those needs are linked to cleaner and safer streets. But, for all the listening I and some of the great folks involved with the South L.A. Mobility Advisory Committee* are prepared to do to engage folks on planning issues, until the city commits to dealing with the issue of equal access, it will likely continue to be a challenge to get people fully on board with improving streets they do not have the privilege of enjoying peacefully. Anything city planning and LADOT can do to collaborate with law enforcement to encourage better community-based policing strategies, foot and biking patrols, and making neighborhoods feel like communities as part of their outreach process and implementation efforts can only benefit the area. Young men could finally feel better about themselves and their potential to make positive contributions to their neighborhoods. And our readers would finally get a break from seeing this issue pop up in every third article I write. Everybody wins! *The Mobility Advisory Committee is organized by representatives of TRUST South L.A. and Community Health Councils (CHC), in collaboration with the LACBC and the LADOT’s Bike Program. They work on creating visions for and advocating on behalf of friendlier streets for cyclists and pedestrians via community outreach, collaboration with other advocacy organizations, events sited in communities, and engagement of city planning. They meet monthly (next mtg. : June 29th, 10:30 – noon, at CHC) and are holding a Complete Streets Forum this Thursday evening. Click here for more details. Nah, I think it’s probably part of why you won that award. Between reading things like this and Ta-Nahesi Coates, I’ve come to realize that this kind of unfair treatment and the legal and social consequences that come from it is one of the biggest things preventing communities like South LA from improving from within. If that’s not one of the most underappreciated concrete planning issues, what is? Put another way… I grew up in the burbs, went to engineering school, worked with lots of professionals. As useful and enlightening as they are, I don’t really *need* Streetsblog articles to tell me about Measure J or the safety benefits of better bike infrastructure. This kind of article is way outside my day-to-day experience, and that’s a great thing. So, um, keep up the good work. I like the fact that you bring up the issues that confront young men in South LA, and make people aware that there are more pressing concerns for them then where to put a bike lane. But I don’t think it follows that moving towards a solution is as simple as encouraging a stronger link between planning and policing. There is a limit to just much planners can become involved in issues like crime, education, and health. Planners can incorporate design elements to make streets safer from crime, or make it easier for kids to walk to school, but in the same way that they can’t tell a school to restructure its schedule to allow student more time to exercise, it’s my sense that they can’t micro-manage the relationship between a police officer and a citizen. True, it isn’t a planning issue, per se. But it should be if planners want their infrastructure to be successful in communities like South LA. A bike lane is no good in an area if a kid is afraid he is going to get jacked by a gang member or stopped by a cop and accused of stealing his bike, given a bogus ticket, or just plain harassed. The kid ultimately will not use the lane and it fails as a strategy to improve the community. You look at any graphic or report on livable streets and enforcement of traffic laws is seen as key to making communities safer for biking and walking (I’m actually working on helping someone revise just such a report as we speak). Which is great in communities where all people already move about their communities freely. In areas where profiling, gang activity, and crime are problems, other safeguards and programming have to be put in place for infrastructure to be successful. That, to me, is common sense. Planning needs to be more flexible and adaptive to the unique communities it aims to improve. It can’t begin from the “all things being equal” premise because all communities are not created equal and it needs to work in greater collaboration with development and other agencies to ensure that opportunities created by new plans can be taken advantage of by folks in that community. 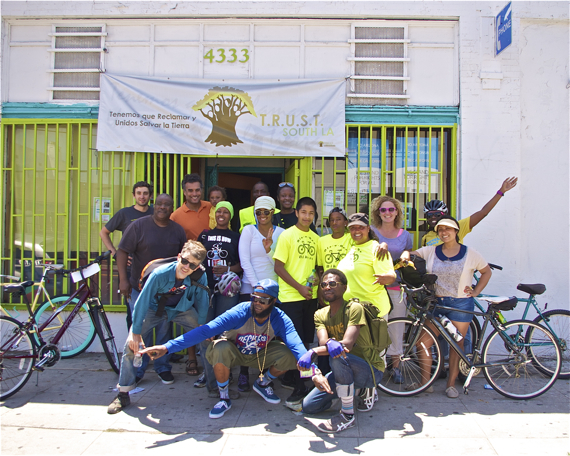 The same fix in Silverlake will not work in Watts without some adjustment. That doesn’t mean Watts shouldn’t have nice things — indeed, they really want nice things — but it means that we need to understand the conditions that will make it possible for residents to take advantage of those nice things so that they make a successful contribution to the betterment of the community. You are beginning to see some flexibility in the form of the Mobility Element being open to incorporating health and wellness concerns and i am grateful that they’ve been open to hearing my spiel about things like who will and will not benefit from things like bike-friendly streets and why, the need for protected lanes, and what kind of data should drive thinking about ped districts, for example. The extent to which those specifics can be incorporated into general plans remains to be seen, but it feels like there is increasingly an understanding that communities have specific needs. Still, the law enforcement thing remains a huge obstacle. It keeps streets from being livable sites of recreation. But it doesn’t have to be. 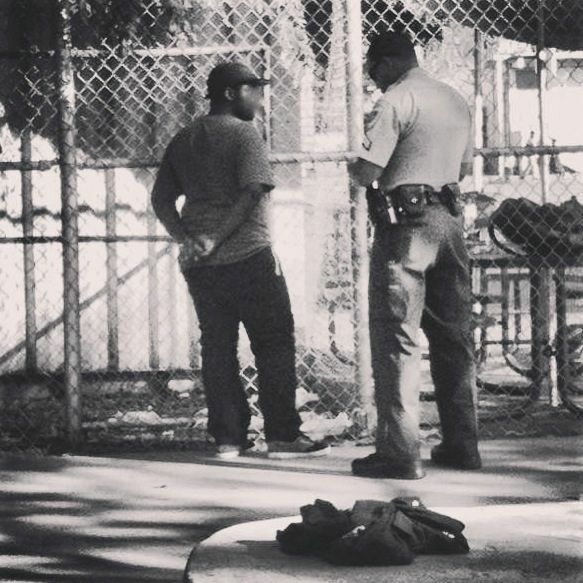 I heard a great story from some youth in Boyle Hts yesterday about how they began holding free concerts in the Hollenbeck park and earned the respect of some law enforcement officers in the area. One kid who used to be a troublemaker transformed his life by getting involved in dance at those free events and helping out at Summer Night Lights — a parks program that involves law enforcement in keeping the park open and safe for kids til late at night. Some of those officers recognized the youth in the street one day and told him to get in the back of their car. He freaked out, thinking they were going to hurt him. Instead, they told him they were taking him out to lunch because they were proud of him turning things around for himself. It was a huge moment for him — those same officers used to stop and harass him. That’s the kind of relationship we need to see between officers and the community, and the more opportunities there are for law enforcement to see that the community is also interested in being a better place opens the door for communication and collaboration between the two. Planning outreach efforts — where residents are asked to talk about their vision for the community — could provide a great forum for that dialogue. Dealing with those issues might also help bring in the participation from the wider range of community members that planners struggle to reach now. A lot of folks in city hall are asked to do a whole lot with few resources and staff — I’m very aware of this. But they’re also making huge decisions that will affect resource allocation and development for decades to come. Why not think about creative ways to make those investments as cost-effective and successful as possible? I totally agree with this, and I also concur with the need for plans to be flexible to handle different neighborhood issues. I just think these are far more difficult tasks to handle than you are making them out to be. This may be so. But there are many other things that keep streets from being liveable communities, such as the ability of cops to respond to multiple incidents in a night. In the Florence-Firestone neighborhood the cops don’t even deal with tons of stuff that they should. I once saw a cop respond to a neighbor’s call reporting domestic violence by knocking on the door and when he didn’t hear anyone answer, he said in a loud voice something along the lines of: “I hope the situation is under control, because I have to respond to another incident” and he ran back to his car. Consider: if you are putting a Watts cop in a park at night, what are the things she won’t be responding to that night? Domestic violence calls? Gang kids hanging out in an alley and keeping people from leaving their house at night to walk to the store for an ice cream? Fostering relationships between cops and kids is great, and it could be that putting the cop in the park with kids at night is the answer. But maybe it isn’t- and anecdotal evidence will not answer this question. Even if the current situation isn’t working, there is a cost/benefit analysis that needs to be done in which it becomes clear that the benefit of deploying X amount of cops on foot patrols and in park programs is preferable to what they currently do now. But in my opinion it is not the job of planners to do this any more than the teachers should do it- they have too much to do already. It’s for our elected officials, the police department, and the public. One last note: in 2008-2009 there was significant outreach in the Florence-Firestone District in a Vision Plan that involved community workshops and outreach to local stakeholders. In the Health and Safety section, the top concerns were: crime and gangs, trash, graffiti, code violations, and lack of access to health care. There is nothing about law enforcement stereotyping. I am not saying stereotyping isn’t a problem. But this does present the possibility that- despite what the Florence-Firestone resident quoted in your piece said- law enforcement stereotyping isn’t the single most pressing concern for a majority of residents, and thus it is potentially misguided for planners to assume they need to make that particular issue their priority to make any headway in this neighborhood. I never said profiling is the single-most prevalent concern above all — obviously safety and crime are key for many. In relation to the planning issues, however, it is very much at the top of the list. People care a lot more about having the right to be in the street than whether or not there is a bike lane there. And they really aren’t going to care about a bike lane until cops stop giving them bogus tickets for riding without lights during the day time. I’ve done enough community door-knocking and interviewing and community volunteer work over the past 8 years to feel highly confident in the claim that profiling is a significant problem across the city. We will have to agree to disagree on that. It also matters because it isn’t just a question of not wanting to be profiled. The lack of trust in law enforcement because of profiling and mistreatment of people of color means that those people don’t see law enforcement as an ally. Depending on the crime, people may not call law enforcement because they fear retaliation from the perpetrator and know that law enforcement will not be there to protect them. Community policing is about having relationships with people that open up those communication channels. Once they are open, officers’ jobs become easier. People are more willing to give them information that will help reduce crime in an area. Right now, people constantly complain to me about feeling shaken down for no reason while actual crimes are being committed. Why are you frisking me for weapons, when there are known spots (like the 103rd St. Station) where people lie in wait to rob folks? is a typical complaint. A lot of officers’ time is wasted hassling people who are not committing crimes instead of more productively addressing those that are, in other words. oops, and one more thing: That’s great that you can give me the list of things that residents signaled as being a problem, but you realize that the whole point of the article is that the very people who are most affected by the problem of profiling are, for that very reason and because they feel they won’t be heard because it tends not to be a question they are asked, unlikely to show up at a meeting to contribute their ideas, right? They are effectively disenfranchised. That was the whole point of the piece. The whole point. We do not disagree on this, nor do I discount the other problems relating to police harassment and disenfranchisement. These are real and urgent problems. I’m willing to be convinced otherwise. But it’s like other issues that intersect with planning like employment and education, there are things planners can do, but also limits. I think our main disagreement is on where to draw this line, not in our overall assessment of the issues confronting these communities.